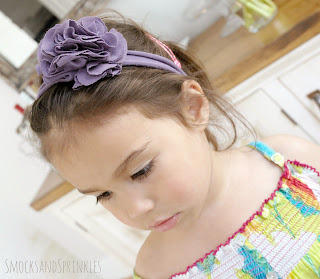 Time is a precious commodity when you have children, so today I'll be showing you how to make an incredibly fast and easy flower hairband. 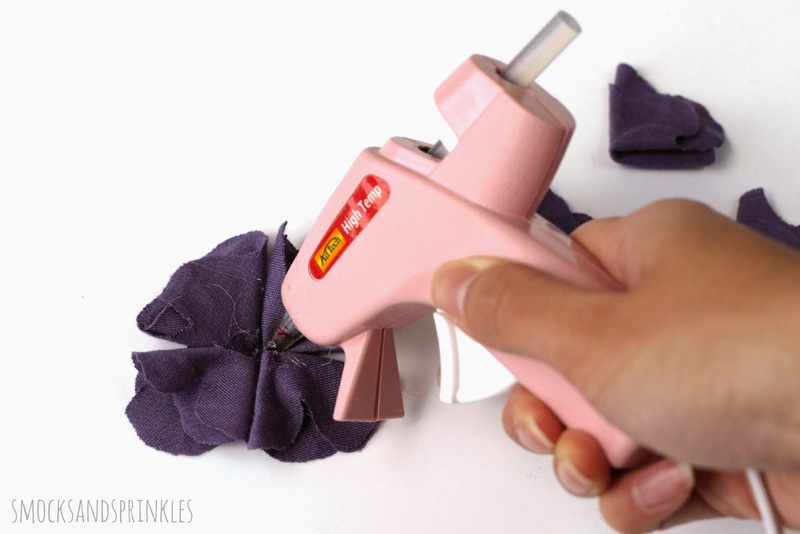 It takes less than 15 minutes and requires no sewing. And it is just so cute! Admittedly, I wish I had made a bunch of these when my daughter was younger, because they're nice and soft in case you want to put them on your newborn (can you say, "newborn photoshoot"?). 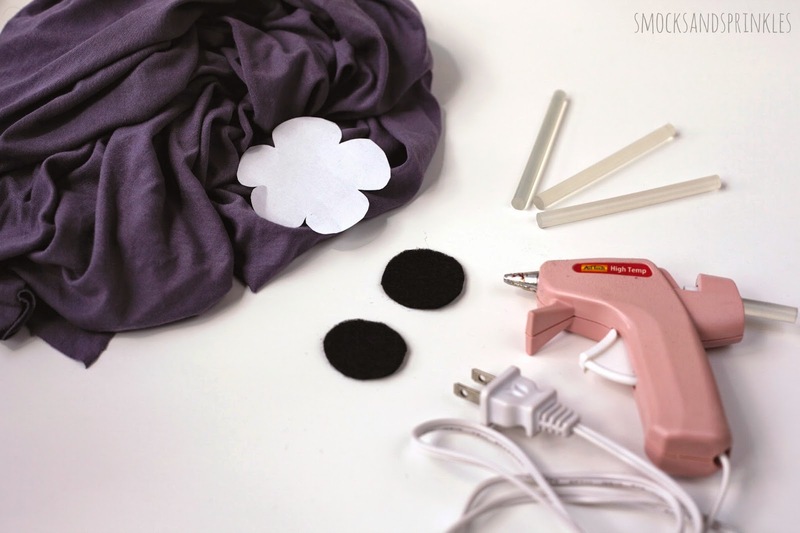 Note: The number of cut out flowers you need will depend on the thickness of the knit fabric that you use. The purple fabric you see in the photos is a thinner, slinkier jersey knit, while the dark gray is slightly thicker and stiffer. I used 16 cut out flowers in the purple, and only 10 in the gray fabric. You will also need fewer flowers if your finished flower size is smaller. Tip! Have a t-shirt you don't wear anymore? Re-purpose it into this cute headband! Tip! If you're going to get serious about crafting with fabric, consider reserving a special set of scissors just for fabric (and keep them away from paper, hair, and anything else your kids will try to use them on!). This will keep them nice and sharp. 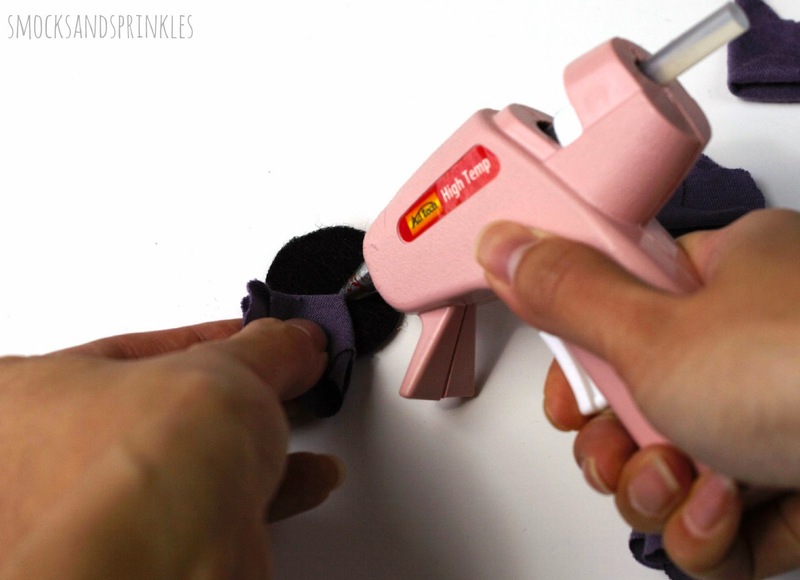 Plug in your hot glue gun now, so you can let it get hot! 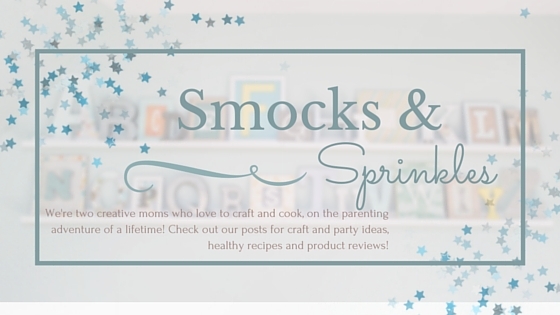 It's like preheating your oven, but for crafting! 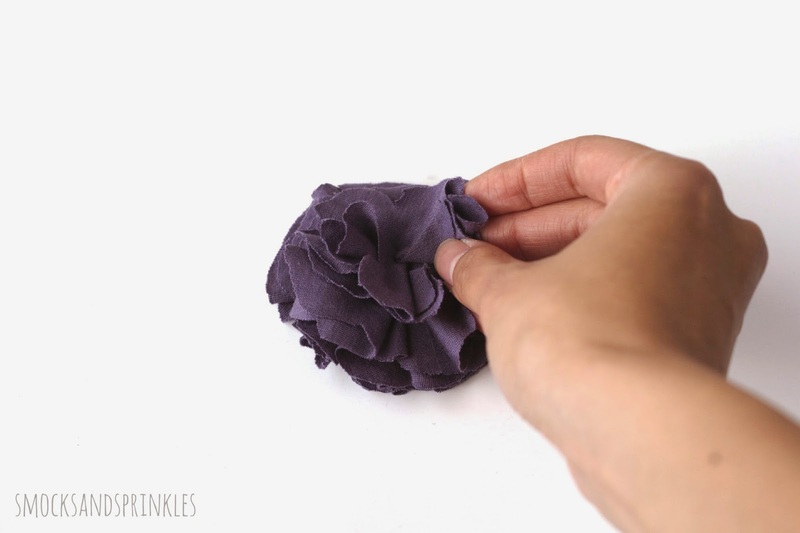 Draw out a flower onto a piece of paper, roughly the size you want your finished fabric flower to be. Cut this flower template out. You can draw 4 or 5 petals on your flower. I did 5 petals, and the diameter of my flower was about 7cm across. Take a stack of 4-5 squares and pin your flower template to the top. Take your scissors and cut around the flower. It doesn't have to be neat, but try to use slow, long strokes to make the edges smooth. Repeat until you've cut out all your fabric flowers. Don't panic if your flowers are uneven or slight wonky. Everything will look amazing at the end, I promise! 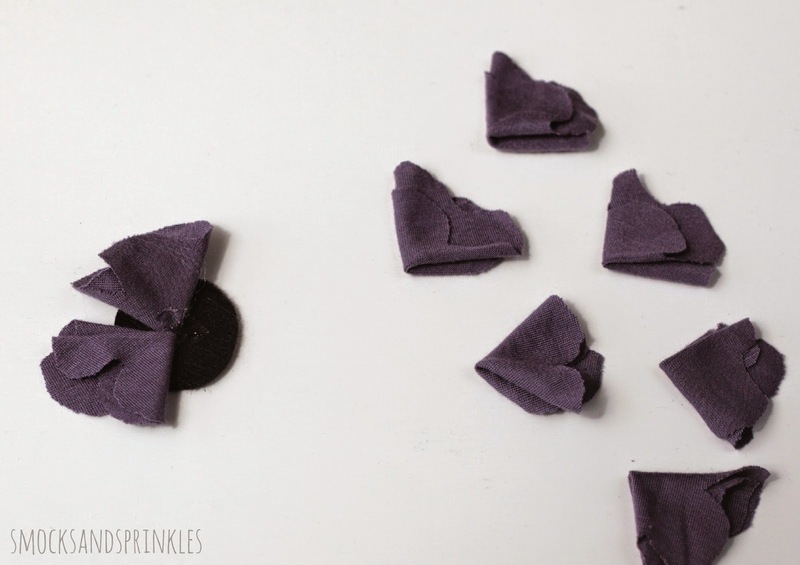 Fold each flower into quarters (into half, and then into half again). You can see what they look like in the photos below. 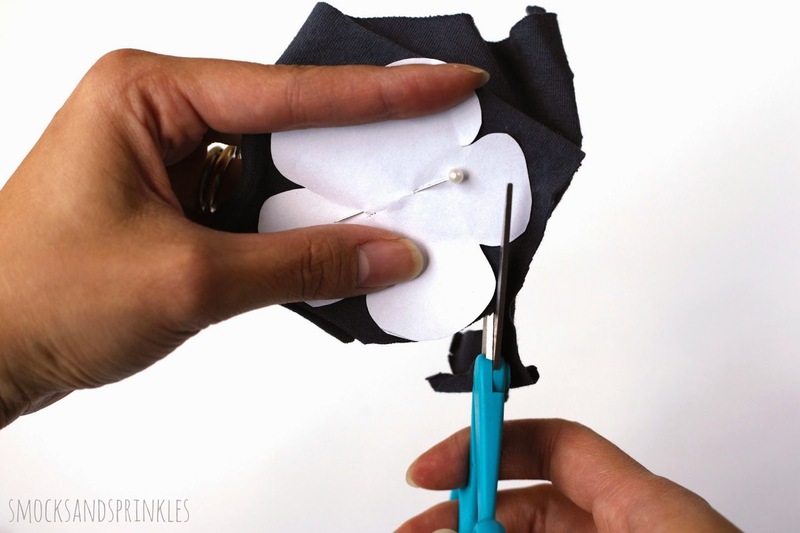 Cut 2 circles out of your felt, slightly smaller than the flower. 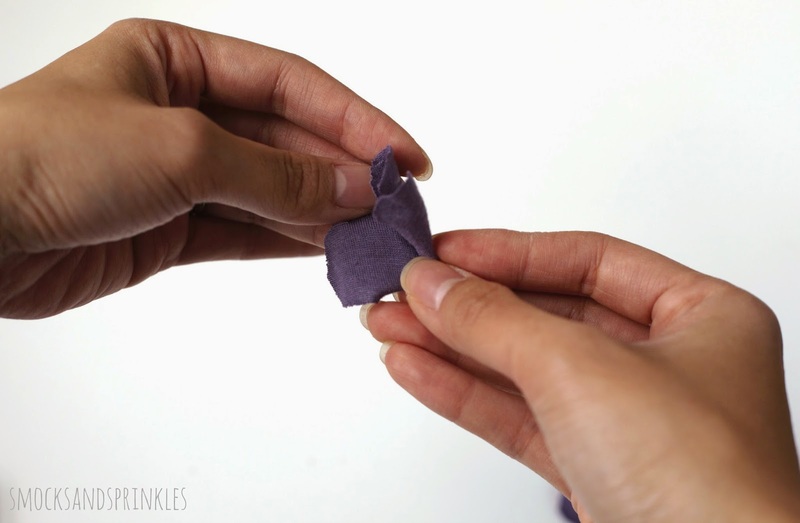 Squeeze a dot of glue into the centre of the felt. 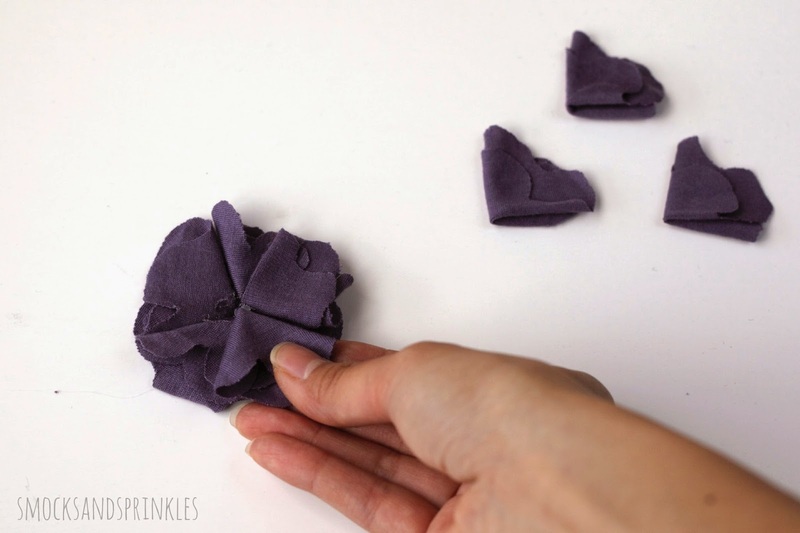 Take each folded flower and glue the corner down. Your first layer should have 4 flowers. 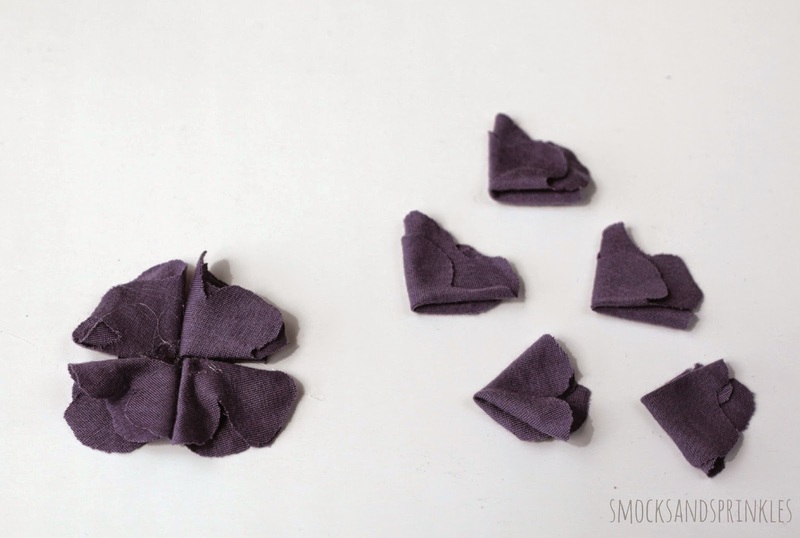 Take another 4 flowers and glue the corners to the middle of the felt, but stagger this layer so that you're covering the cracks between the flowers in the first layer. Mathematically speaking, it's a 45 degree rotation. I used my glue gun to squish the centre corners periodically, to make sure the flowers really adhered well. Keep going until you have one or two flowers left. 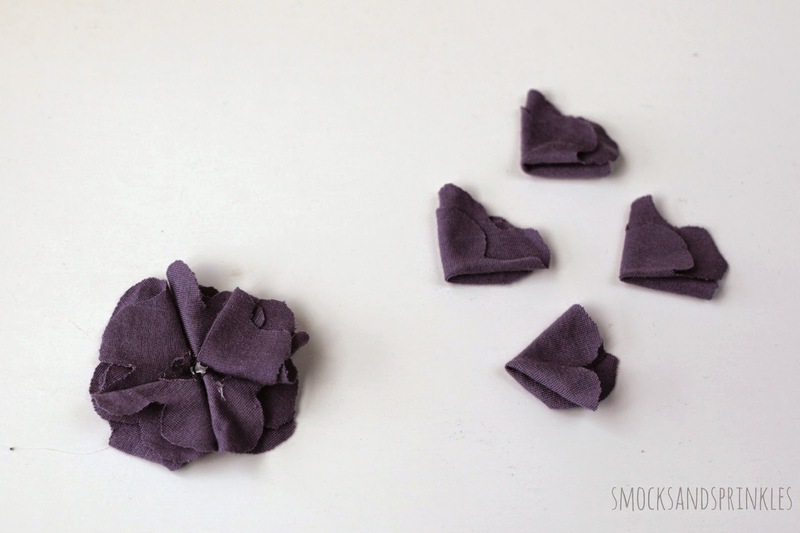 Roll these flowers and attach them to the centre of your large flower. You can go back and fluff the flower, but voila, you have a gorgeous flower. Aren't you a little bit impressed with your skills? Cut a long piece of knit fabric for the headband. 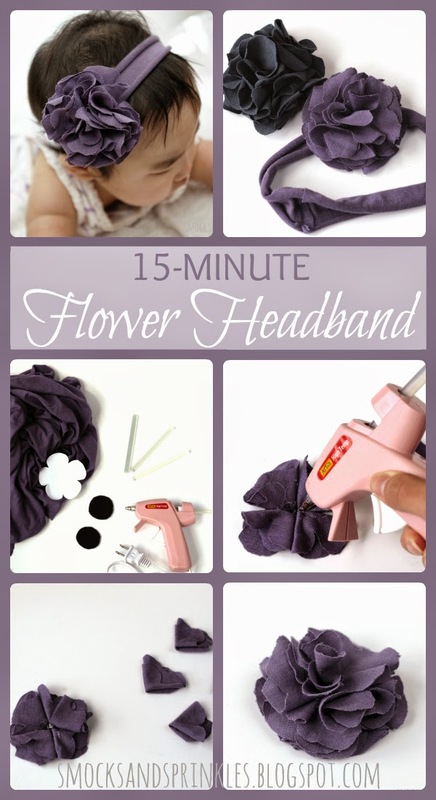 You can wrap a long piece of fabric around your little one's head to figure out how long to make it. Mine measured 37 cm long by 5 cm wide. 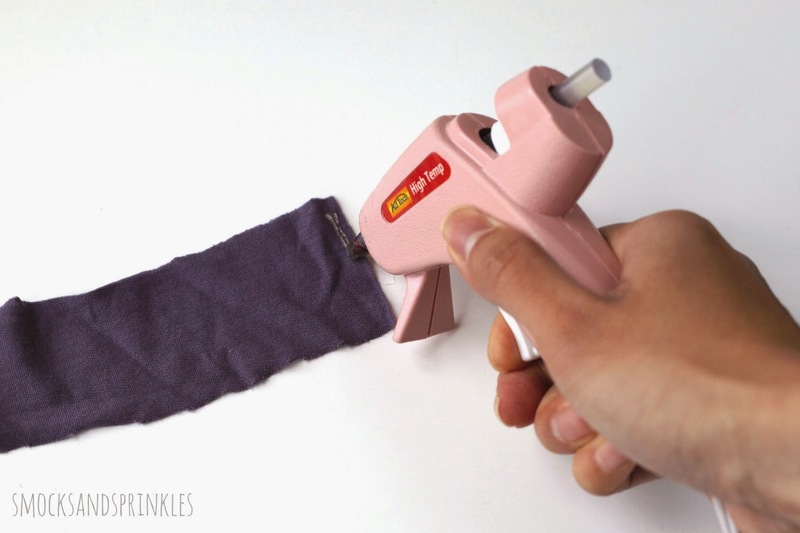 Run a line of glue along one end and attach the other end, overlapping the fabric by about 1 cm. 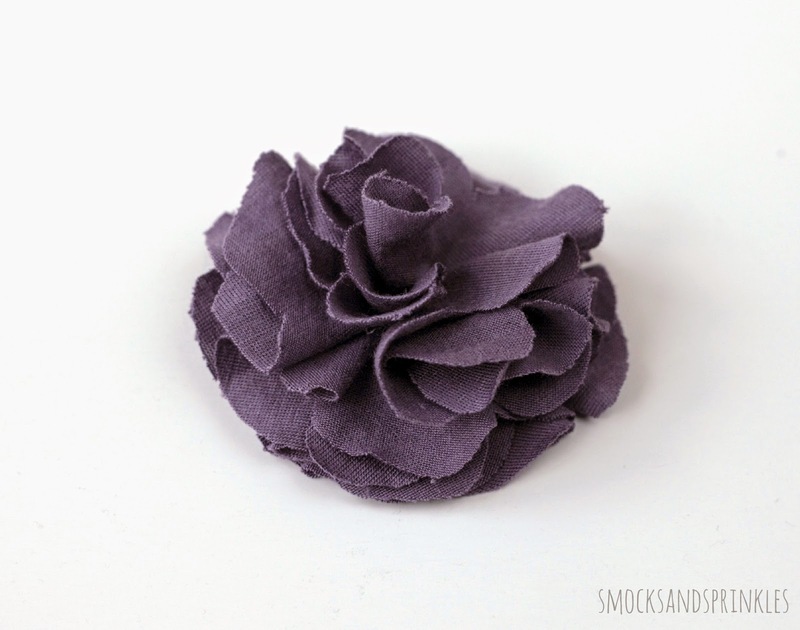 Glue your large flower right over this seam, and glue the other felt circle underneath, so the dried glue doesn't scratch your little one's head. 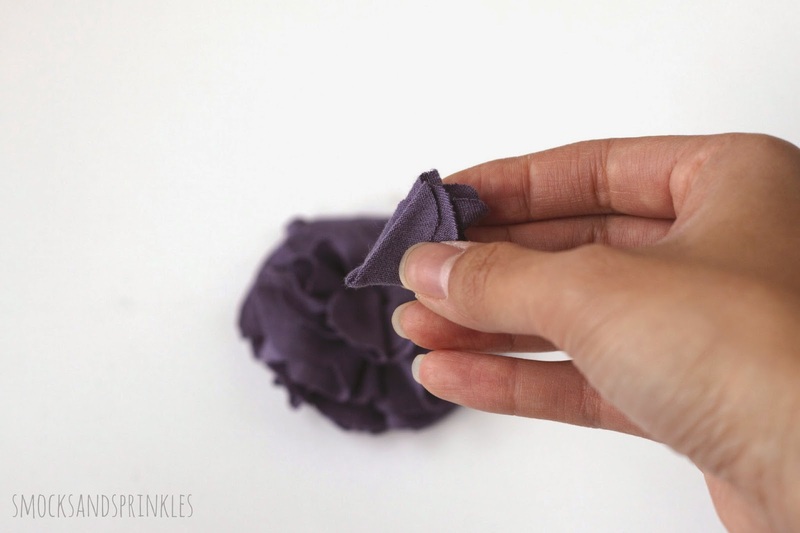 Give your hairband a tug to stretch the fabric. Tip! Glue a cute button or jewel in the centre of the flower to make it even fancier! Tip! 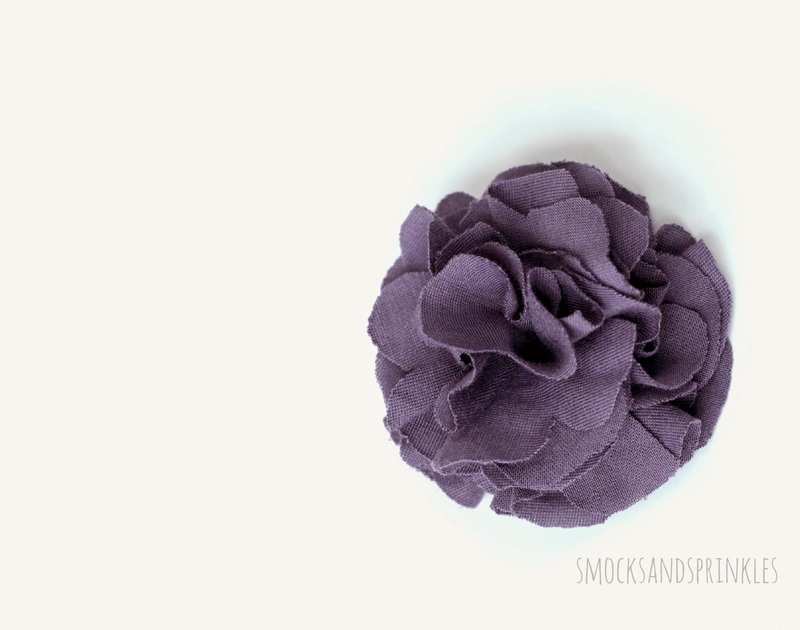 Make the flower out of felt or chiffon for a different look. I hope you have fun creating these headbands in lots of different colours for your little one! Let us know how they turn out, or if you have any questions or suggestions for making these even easier!